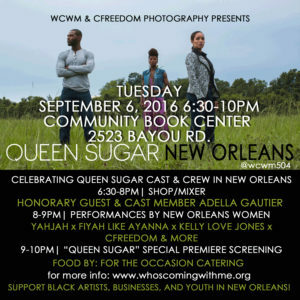 WCWM & CFREEDOM PHOTOGRAPHY PRESENTS A TWO NIGHT PREMIERE SCREENING OF NEW TV SERIES "QUEEN SUGAR", FROM THE VISIONARY FILMMAKER AVA DUVERNAY AND EXECUTIVE PRODUCER OPRAH WINFREY. HOSTED BY TWO AMAZING TREASURES IN THE NEW ORLEANS COMMUNITY, COMMUNITY BOOK CENTER & ASHE CULTURAL ARTS CENTER, BOTH NIGHTS PROVIDE A VERY WORTH WILD EXPERIENCE AND INTENTION OF CELEBRATING QUEEN SUGAR CAST & CREW MEMBERS IN NEW ORLEANS AS WELL AS THE BLACK BUSINESSES THAT SO GRACIOUSLY PROVIDED THEIR SPACE FOR THE SCREENINGS. DETAILS BELOW! DONATIONS TO THE VENUES ARE SUGGESTED! Its a celebration of all Queen Sugar cast & crew in New Orleans. Whether you were a producer or an extra, we are celebrating you! We are also celebrating Black businesses, artists, and youth in New Orleans. Special guests and cast member Adella Gautier aka "Adella Adella the Storyteller" will be at Community Book Center with us so spread the word and the love! 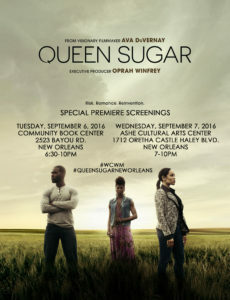 Performances by New Orleans women followed by the premiere of Queen Sugar on OWN at 9pm! Food by "For The Occasion Catering". Drink sells donated to Community Book Center. Come early to shop, eat, drink and build community! 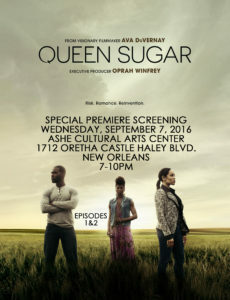 Join us for on the 2nd premiere night at Ashe Cultural Arts Center, for a very special back to back screening of Episodes 1 & 2 of Queen Sugar. Doors open at 6pm! 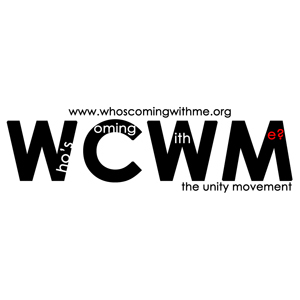 Please shop at the Diasporic Boutique, and make a donation to the venue! From award-winning filmmaker Ava DuVernay (“Selma”) and executive producer Oprah Winfrey, the contemporary drama “Queen Sugar” chronicles the lives and loves of the estranged Bordelon siblings in Saint Josephine, Louisiana: Nova (Rutina Wesley, “True Blood”), a world-wise journalist and activist; Charley (Dawn-Lyen Gardner, “Unforgettable”), the savvy wife and manager of a professional basketball star; and Ralph Angel (Kofi Siriboe, “Awkward”), a formerly incarcerated young father in search of redemption. After a family tragedy, the Bordelons must navigate the triumphs and struggles of their complicated lives in order to run an ailing sugarcane farm in the Deep South. Led by acclaimed film director DuVernay, who directed the first two episodes, all episodes in the series’ debut season are directed by women. 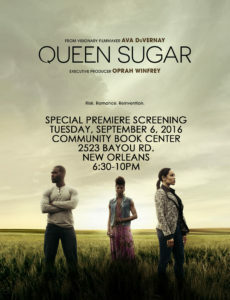 “Queen Sugar” is produced for OWN by Warner Horizon Television. The executive producers are Ava DuVernay, Melissa Carter and Oprah Winfrey. The series is based on the book by Natalie Baszile. The expansive cast includes Tina Lifford (“Parenthood”) as Aunt Violet; Omar J. Dorsey (“Ray Donovan,” “Selma”) as Violet’s much younger boyfriend Hollywood Desonier; Dondré Whitfield (“Mistresses”) as trusted Bordelon family friend Remy Newell; Timon Kyle Durrett (“Single Ladies”) as Charley’s husband, professional basketball star Davis West, Nicholas L. Ashe (The Lion King - National Tour) as Charley and Davis’ teenage son, Micah; Greg Vaughan (“Days of Our Lives”) as a local cop and Nova’s lover, Calvin; and Ethan Hutchison (“The Path”) as Ralph-Angel’s son, Blue. Additionally, Emmy and multiple NAACP Image Award-winning actor Glynn Turman (“The Wire”) guest stars as family patriarch Ernest Bordelon; Henry G. Sanders (“Rocky Balboa”) recurs as Prosper Denton, a farmer and longtime friend of Ernest, Bianca Lawson (“Rogue”) guest stars as Ralph Angel’s ex-girlfriend and mother of Blue, Darla; and Marycarmen Lopez (“From Dusk ‘Til Dawn: The Series”) as Blue’s elementary school teacher. DuVernay directed the first two episodes of “Queen Sugar” and hand-picked an all-female roster of directors to helm the subsequent episodes of the series’ first season. The slate of both seasoned and emerging directing talent includes Tina Mabry (“Mississippi Damned”), Victoria Mahoney (“Yelling to the Sky”), Tanya Hamilton (“Night Catches Us”), So Yong Kim (“Lovesong,” “Treeless Mountain”), Kat Candler (“Hellion”), Salli Richardson-Whitfield (“Eureka”) and Neema Barnette (“Woman Thou Art Loosed: On the 7th Day,” “Being Mary Jane”).